A Los Angeles Times article about John Cage's formative years in the cultural stew of 1920s and '30s L.A. quotes how the city was described in 1913 as susceptible to "spiritualists, mediums, astrologists, phrenologists, palmists and all other breeds of esoteric wind-jammers," to say nothing of "mazdaznan clubs, yogi sects, homes of truth, cosmic fluidists, astral planers, Emmanuel movers, Rosicrucians and other boozy transcendentalists". The inclusion of the Rosicrucians in that list of West Coast movers and shakers is prescient, as the secretive society of the Rosy Cross re-entered Cage’s life thirty years later via his fascination with the music of Eric Satie - in the 1890s Satie was the official composer and chapel-master of the Rosicrucian Order Ordre de la Rose-Croix Catholique, du Temple et du Graal in Paris and several of his works of the period are linked to Rosicrucianism. There are many other composers with connections to Rosicrucianism including Claude Debussy and Edward Elgar, the latter composing incidental music for a play written by a member of the associated Hermetic Order of the Golden Dawn. Rosicrucianism has its origins in early-seventeenth-century Germany when a series of pamphlets surfaced reporting the existence of a mysterious brotherhood named after the fourteenth-century knight Christian Rosenkreutz. The mythology of the Rosicrucians captured the public’s imagination and fascinated influential figures as diverse as Descartes, Swedenborg and Leibnitz, and it has continued to attract occultists to the present day. All this despite recent academic research suggesting that Christian Rosenkreutz never actually existed, and despite evidence that the pamphlets were written by a group of Lutheran mystics as an allegorical spoof. Michael Maier is an important figures in the history of the Rosicrucians, and his influence spread as far as the court of King James I of England, where he was for a time an advisor. Born in Ruidsburg, Germany around 1568, Maier, who remained a strict Lutheran all his life, combined his career as a royal counselor and physician with the extracurricular activities of occultism, alchemy, and – surprisingly - composing. Maier’s most celebrated work, his 1617 Atalanta Fugiens, is an alchemical emblem book that contains imagery, poems and text, and also fifty epigrammatic vocal fugues, or to be more accurate, two-part canons with a plainsong cantus firmus. The fugues have recently been recorded by Michael Noone and his Ensemble Plus Ultra for the enterprising Spanish Glossa label, complete with instrumental accompaniment from the mystical combination of Renaissance harp sackbut and the Chinese two-stringed fiddle known as an erdhu. There are many good reasons to recommend this new CD, not the least that this is little known repertoire which is performed both expertly and extrovertly. It is also the starting point of an esoteric lineage that extends across three centuries to Eric Satie and on to the epigrammatic mesotics of John Cage. 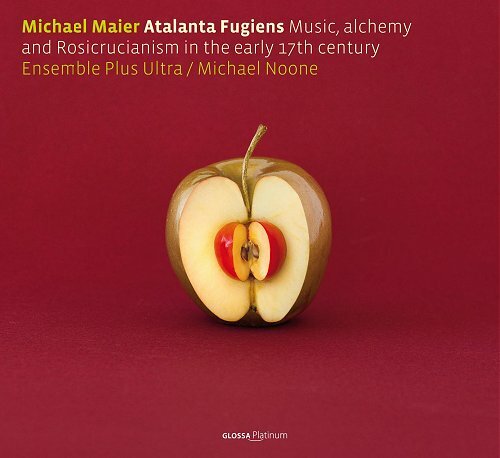 But the main reason that I heartily recommend Glossa's catchily titled Atalanta Fugiens: Music, Alchemy and Rosicrucianism in the early 17th century is to support a brave project that provides reassuring evidence of life beyond 'condescending classics'. * Photo 4 in my post about alchemist and serial child abuser Gilles de Rais shows a reconstruction of the villain’s chamber in Tiffauges Castle. One of the books in the photo is Michael Maier’s Atalanta Fugiens. Ah. I wondered about those books in Gilles de Rais' chamber. I was hoping they were his books, or at least contemporaneous, but as Atalanta Fugiens was published 177 years after the monster got his just desserts, that's a bit disappointing and puzzling -- I'd have thought those who reconstructed the room could do a bit better than that. Anachronisms do so jar! Philip, I have even worse news. One of the other volumes on the shelf in Tiffauges Castle was Fifty Shades of Grey.